Does anyone else have a problem actually mailing the cards they make? I don’t know if I’ve ever gotten a card into the mail on time! I make ’em – I just can’t seem to get organized enough to send ’em. To show you how warped my thinking can be – I actually make belated birthday cards in advance. This is so I have a stash of belated cards that I can send when I realize that yes, indeed I missed the date again. Please tell me someone else in cyber world does this too…. Anyway, here is a belated Birthday card made with Odd Bird Planet Stamps. I made this card with the Birthday Circus Cling set. The paper is Basic Gray and its colored with Copics. Why a pink elephant? I have no idea…. This entry was posted in Uncategorized and tagged Basic Grey, Copic Markers, odd bird planet on March 13, 2009 by Cathy. Come on spring! Its colder here today – but I know spring is right around the corner. For this card I used the stamps from the Elegant Nest Cling set to make two love birds snug in their nest. The set contains images by Odd Bird Planet. I stamped the birds in Memento Tuxedo and colored them with Copics. I added some Copic Spica glitter pen. Then I cut them out with a circle Spellbinders die and inked the background slightly with a duster brush and Broken China Distress Ink. I colored the nest, cut out around it and adhered it in front of the birds with foam tape. The background paper is from my stash (Crate Paper). I added the faux stitching by piercing holes with my Tim Holtz Design Ruler (love that thing) and connecting the holes with little dashes of Souffle pen. This entry was posted in Uncategorized and tagged Copic Markers, odd bird planet on March 11, 2009 by Cathy. Time for the second Birthday Blog Bash Challenge. Its an easy one! Many of us are tired of snow and winter – we’re ready for spring! So for this challenge, your entry has to have a flower on it somewhere (stamped, paper, embellishment – whatever you wish). You can make a card, scrap page, or an altered item – just has to have a flowers somewhere (We are called Paper Garden Projects for a reason!). Just leave a comment on this blog post with a link to your creation. I will draw a random winner the challenge from all the comments. The winners for all the Birthday Blog Bash challenges will be drawn on the 31st of the month, so you have till the 30th to get your entry in for this challenge. Please enter the challenge only once. If you share your challenge creation on your blog with a link back to the contest, I’ll put your name in the random drawing twice to double your chances. I made my sample card using the Elegant Nest Cling set. All of the images in the set are from Odd Bird Planet. 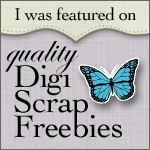 I got my start in the stamping biz with Odd Bird Planet – so that company has a special place in my heart. Joanna even turned a few of my stamp designs into rubber stamps! How cool is that? The flower garland on my sample card (and in the prize pack) was one of my designs. Johanna has many more cute cute an clever designs by different artists than what is carried in Paper Garden Projects- well worth a look if you have never strolled over. You can see Odd Bird Planet here. For my card I stamped the garland twice (overlapping slightly) and stamped the Merci in the middle in Memento Tuxedo ink. Then I colored it with Copic Markers. The image is cut out with a Spellbinders circle die and matted using more scalloped and straight dies. The strip at the bottom was cut from Core’dinations Chocolate Box cardstock and Embossed using the Cuttlebug Just My Type Embossing Border. I lightly sanded the embossing to expose the color core paper (fun stuff!). I can’t wait to see your contest entries (I love flowers!). And remember – you still have till the 30th to enter the Week 1 contest. This entry was posted in Uncategorized and tagged Blog Candy, odd bird planet, spellbinder dies, tool tips on March 8, 2009 by Cathy. Ugghh…. I know I have been a bad, bad, bad blogger! I have not been very good at posting and even worse at visiting my blog buddies! I have one more “bad” week this week – and then hopefully things will open up some. I hope you don’t all forget about me! I so miss being able to play with my little stamps and seeing everyone else’s creations. I did want to pop on and let you know that Odd Bird Planet is have a big sale in honor of Chinese New Year. You can find both mounted and unmounted stamps on sale in all the categories. So check it out if you are interested in some bargain hunting. Speaking of Chinese New Year, its the year of the cow you know…. so I decided to share a “whats moo?” card with you. All of the stamps are by Odd Bird Planet. Its colored with Copic Markers. The patterned paper is a DCWV from my stash and the cardstock is Prism. I hope you all have a wonderful week. Go stamp something for me! This entry was posted in Uncategorized and tagged odd bird planet on January 20, 2009 by Cathy. I decided the Gnome Home from Odd Bird Planet needed a little sprucing up for the Holidays. I was in a bit of a goofy mood and my decorating went a little over the top, but I thought I’d share it anyway. Here is my finished product. I used a bunch of different Odd Bird Planet stamps in my little creation. In case inquiring minds want to know – here’s what I did. I colored my Gnome Home with Copic markers. The mushroom cap is pretty big. To avoid marker streaks, you need a well inked marker. The trick is to color slowly enough to saturate the paper, but quickly enough to keep a wet edge on the ink. Sometimes you need to move around a bit when you color to keep all the edges wet. In large areas, I use the wedge tip of the marker because it delivers more ink. Then I stamped all my “pieces”, cut out around them and colored them. The stamps I used were Cathrine’s Gnome Home, Cathrine’s Sapling, Cathrine’s Sapling Branch, Kelly’s Stiched Gnome, and Simple Gift. The long garland is just Sapling Branch stamped side by side 3 times. Generally, I don’t try to cut right on the line of something. (Its just too hard for me! LOL there is that l-a-z-y thing again!). I usually leave an edge around it. You can see it on the gnome. Before I cut him out, I outlined around him with W-1 gray so he wouldn’t have a stark white border. It makes cutting out so much easier and I think it makes cut out images stand out from the background. BTW – for the gift, I created the dots by coloring the present green and then holding the tip of my blender pen where I wanted a dot after the green ink dried. The blender fluid will push the green ink out and create a dot. So then I just assembled. And added those heaps of embellishments. I added red crystals on the tree and garland. I also added some snow to the windows and ground using the puffy velvet marker. On top of the velvet I added glitter! I know – its a bit extreme – but it was fun! And yes- we do have those gaudy multicolor lights on our tree – not the elegant white ones. We have a mis-match of homemade and”historical” ornaments. I mostly let the kids decorate it – so there are some branches with 3 ornaments hung on top of each other. Martha Stewart would NOT approve – but it works for us. Sometimes you just need to embrace imperfection. Thanks for looking! Happy Stamping. This entry was posted in Copic Marker tips and tagged Christmas, Copic Markers, odd bird planet on December 11, 2008 by Cathy.